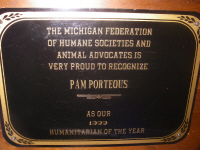 In September of 1999, the Michigan Federation of Humane Societies and Animal Advocates recognized the Animal Care Network Manager Pam Porteous as the Humanitarian of the Year for this program and it’s outstanding contributions and the affect that this program has had on the lives of the animals in this city. BELOW NOMINATION STATEMENT FROM HANNA GIBSON, A HUMANITARIAN IN HER OWN RIGHT. When was the last time that you came into Pontiac, Michigan? I mean really came here, not simply hurrying to the outskirts of the city to see a Lion’s game at the Silverdome, or passing through on your way to Waterford or Bloomfield Hills or any number of cleaner, greener places. Have you been here lately? Have you been here ever? If you are like most people, like I was up until three years ago, you have probably never spent even a moment contemplating the harsh realities that unfold everyday in the shadows of the streets, alleys, basements and backyards in this city. Life here is not easy for anyone really; but the burden of an unprivileged existence falls hardest on the most innocent victims – the children and the animals. The children have social services, but whom do the animals have? From the comfort of our living rooms, with our spoiled pets close by, it’s so easy to believe that all must be right in the world. When peace, serenity and comfort are what you and your animals know, how difficult is it to imagine the desolation, chaos and despair you don’t see. I say this with conviction because until I began working with the Animal Care Network, I could never have believed that only ten short minutes from my home animals languished daily in filth and misery. If has been about three years now since my first weekend outing. I will never be the same. I have never stopped coming back, every week. Those of us who volunteer for this program accept the burden of witnessing, first hand, the plight of the animals here. It is our responsibility to change that which we cannot bear to see. Imagine, if you will, a world of filth, of bitter cold and searing heat, of abuse, neglect, hunger, thirst, of pain and loneliness. For thousands of “companion” animals in the city of Pontiac, this is the only world they know. This is what they wake up to every morning and go to sleep to every night. For anyone that has not witnessed if first hand, it is truly impossible to comprehend. Try to picture the endless hours that these animals spend languishing on the ends of chains. Can you see their broken spirits and hearts? Luckily, you will never have to see where these animals come from or where they end up. You will never see the tortured animals, burned cats and mauled pit bulls. Nor will you have to see the animals that we were too late to save; the dogs curled up dead next to their empty food bowls….waiting for someone, anyone to feed them, even to the very end. Try to imagine the graphic images of collars embedded deeply into the raw, infections flesh of dogs and rubber bands embedded in cats and puppies. Such wounds are so horrible that only death could save them from their misery. Then picture baby puppies and kittens curled up in trashcans full of garbage trying to stay warm in a world that is far too cold for them. If imagining such gruesome scenes makes you uncomfortable, please remember that even as you read this, these things are occurring. Through private donations and funding we search out the animals in need and personally provide them with food, water, doghouses, straw, medical attention, spaying and neutering and many other needs. Most importantly the Animal Care Network has successfully rescued thousands of these animals from their desperate situations. We attempt to educate the people and know most of them and their animals by name. Incredible records are kept with the history of each and every animals. I have witnessed first hand the profound impact that the Animal Care Network has made in this city. For most of these animals, we are their only friends, for some their only source of food or warmth. It is truly devastating to see how some animals are forced to spend their lives. I have seen many volunteers quit when the emotional burden becomes too overwhelming. Those of us who stay are constantly overwhelmed, yet will never quit. If we quit, even for a day, even for a moment, there will be no one looking out for these animals and they will suffer. If is often equally as rewarding to go and check in our little animals, and know that at least for a day, they will have food, water and shelter, and they will know at least for a moment that someone cares. As I reflect on the thousands of furry faces we have encountered in Pontiac over the years, I am reminded of the words of Margaret Mead, “Never doubt that a small group of thoughtful, committed citizens can change the world: Indeed it’s the only thing that every has”. I commend the Animal Care Network for changing our little corner of the world!